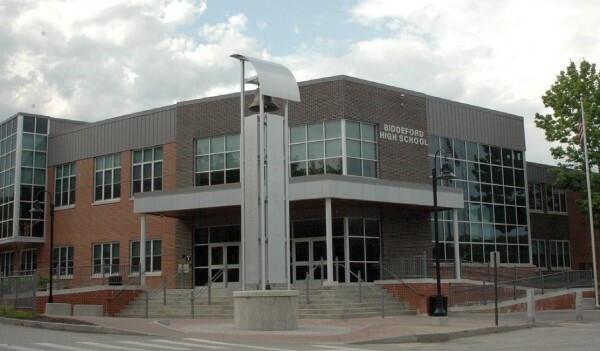 BIDDEFORD, Maine — An investigation into a recent internet threat at Biddeford High School that caused classes to be canceled for a day has resulted in a BHS freshman facing a felony charge of terrorizing. Police announced on Friday that a 15-year-old male student was charged after posting an anonymous threat on a mobile application called After School on May 25. The threat consisted of a gun emoji and a television clip of a person brandishing a gun, according to school officials. A small group of students made school officials aware of the post, which police say included a caption that referenced the high school for the following day, May 26. Classes at the school were subsequently canceled for that day. The suspect’s identity is being withheld because of his age. Biddeford Police Deputy Chief JoAnne Fisk said the student does not have a previous arrest record, and was cooperating with police. Terrorizing includes the threat to cause or commit violence dangerous to other people’s lives, whether or not the violence occurs. According to the Maine Criminal Code, terrorizing is considered a Class C felony crime if threats include the evacuation of a building or cause people to be moved to, or remain in, a designated area. Police said the student is now working with a Juvenile Community Corrections officer as he awaits a date in juvenile court. Punishment could range from probation to commitment at Long Creek Youth Development Center in South Portland, Fisk said. Neither Ray nor Fisk could go into specific details of the investigation. However, Fisk did say police were able to “dial into certain information” through the help of the After School app . The app requires students to verify their student status at an area high school through use of their phone’s location settings. Once verified, a user can post while using an “avatar,” or online identity, that represents his or her anonymous account. The app’s website states that it takes threats seriously, and that it uses a notification system to alert school officials and law enforcement when a threat may pose a risk to an individual or school.